Last year, my book was released in Delhi. The video and transcript of the discussion have been uploaded now. Mushir ul Hasan:Â Iâ€™m delighted to be associated with the launch of this book; however, I believe that the subtitle of the book could have been a touch different. 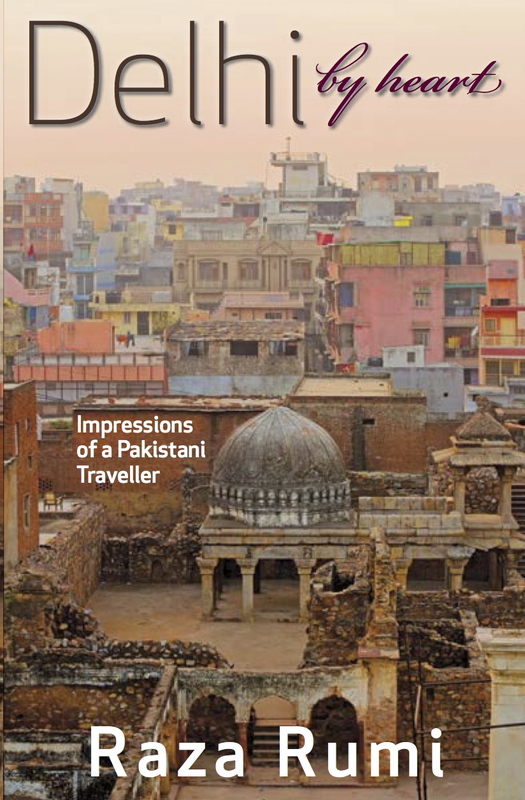 â€˜The impressions of a Pakistani travellerâ€™Â â€“ immediately creates an image in my mind of the â€˜distinct otherâ€™, and I think it is this sense that weâ€™re probably trying to do away with here. One of the strengths of this book lies with the fact that it does try to bridge the intellectual and cultural gap that exists, or has been created, since both countryâ€™s gained independence in 1947. I particularly noticed the fact that Raza doesnâ€™t actually look at Delhi, its cultural profile and its social profile as an outsider or someone who hails from Pakistan. He demonstrates empathy and respect for the city and has knowledge of the cityâ€™s development and its growth. According to me, he relied on skill and intuition to study some of the features of this city â€“ particularly those of you who have read the sections on the Sufi shrines. Theyâ€™re not only informative to many readers, but evocative at the same time, and yet in a certain sense, they also represent, the true character and complexion of this diverse city. I would like to thank Mr. Raza for writing a book aboutÂ â€˜our cityâ€™; as it is a very lively, vivid and comprehensive narrative. I would also want to bring to the attention of academicians, that in order to understand the book, one needs to draw a distinction between academic and journalistic writing. The thin line that divides the two is blurred nowadays, which is why I would be glad to recommend your book to my students to understand what eloquent and comprehensive writing is all about. The book has a considerable amount of interesting insights, with the exception of certain sections. The book is incisive from the outset and it looks at a city through a holistic lens. To eloquently describe its history, its past and its present without having lived here is a commendable effort and I am lending my voice and my views, to the number of reviews that have already appeared in the newspapers, regarding the book. Almost all the reviews that I have read are very interesting and I do hope that this book will go a long way in familiarizing Razaâ€™s countrymen and our countrymen with the vibrancy of this city, its multifaceted personality and the manner in which Delhi has grown over the centuries. Thank you once again, for writing such a good book. Just finished reading your excellent book under review. Brought back memories of my grand mother’s residence known as “Khalida Begum ki Haveli” located in Kucha Nawab Mirza, Mohalla Fatehpuri. To reach it, one had to leave the tonga at the main round and walk quite a distance along winding lanes, covered “chattas”. The next door house belonged to some relatives of Imam Bukhari and it’s claim to fame was that a British canon ball had landed in it’s “sehan” during the 1857 uprising. Farther down was a house in which lived the descendants of Dipty Nazir Ahmed. You have written extensively the cuisine of Delhi. However, perhaps you never came across “shab degh” a dish that contains radishes and “koftas. It was served only at night, hence the name. “Khichidi” too is eaten at night along with various achars and chutneys and is one of my favourite dishes. By the way my grand mother was well known to Sadia Dehalvi’s family, especially the late Yunus Dehalvi and also to Khawaja Hassan Nizami. Talking of Delhi literati, How about Allama Rashidul Khairi? My gm was a great character and once stopped the motorcade of Pandit Jawaharlal Nehru to make a complaint about the then Chief Commissioner of Delhi. I simply want to say I am newbie to blogging and site-building and actually savored your web page. Likely I’m going to bookmark your site . You surely have exceptional writings. Appreciate it for sharing your webpage. What the analysts normally are not proclaiming on the subject of Ataşehir kurye in a manner that this can affect you. Hey there. I found your site via Google while looking for a similar subject, your website got here up. It looks great. I have bookmarked it in my google bookmarks to visit then. I’ve learn several excellent stuff here. Certainly value bookmarking for revisiting. I surprise how much effort you place to create one of these magnificent informative site. Hi there. I found your blog by the use of Google at the same time as searching for a related matter, your web site got here up. It seems great. I’ve bookmarked it in my google bookmarks to visit then. Hiya, I am really glad I have found this info. Nowadays bloggers publish only about gossip and net stuff and this is actually annoying. A good blog with interesting content, that is what I need. Thank you for making this website, and I’ll be visiting again. Do you do newsletters by email? Hi there. I discovered your website by means of Google whilst looking for a similar matter, your web site came up. It appears to be good. I have bookmarked it in my google bookmarks to come back then. Hi there. I discovered your website by means of Google while looking for a comparable subject, your website got here up. It seems to be great. I have bookmarked it in my google bookmarks to come back then. Hello there. I discovered your website via Google even as searching for a comparable subject, your site came up. It looks good. I have bookmarked it in my google bookmarks to visit then. Hiya, I’m really glad I have found this information. Nowadays bloggers publish just about gossip and net stuff and this is really irritating. A good blog with exciting content, that is what I need. Thank you for making this site, and I’ll be visiting again. Do you do newsletters by email? Hi there. I discovered your web site by the use of Google whilst looking for a similar subject, your website got here up. It seems good. I have bookmarked it in my google bookmarks to come back then. Hiya, I’m really glad I’ve found this info. Today bloggers publish just about gossip and net stuff and this is actually irritating. A good website with interesting content, that is what I need. Thank you for making this web site, and I’ll be visiting again. Do you do newsletters by email? Hi there. I discovered your website via Google while looking for a similar subject, your web site came up. It seems to be good. I’ve bookmarked it in my google bookmarks to come back then. Hello there. I discovered your web site by the use of Google even as searching for a related matter, your web site got here up. It seems good. I have bookmarked it in my google bookmarks to come back then. Hiya, I am really glad I’ve found this info. Today bloggers publish just about gossip and web stuff and this is really irritating. A good site with interesting content, this is what I need. Thank you for making this website, and I will be visiting again. Do you do newsletters by email? Hiya, I’m really glad I’ve found this information. Today bloggers publish only about gossip and net stuff and this is actually frustrating. A good site with interesting content, that’s what I need. Thanks for making this site, and I’ll be visiting again. Do you do newsletters by email? Hiya, I’m really glad I have found this info. Nowadays bloggers publish just about gossip and internet stuff and this is actually irritating. A good web site with interesting content, this is what I need. Thanks for making this website, and I will be visiting again. Do you do newsletters by email? I¡¦m not certain the place you are getting your information, however great topic. I must spend a while learning more or figuring out more. Thanks for great information I was on the lookout for this info for my mission. Hiya, I am really glad I have found this information. Nowadays bloggers publish just about gossip and net stuff and this is actually annoying. A good site with exciting content, this is what I need. Thanks for making this web site, and I’ll be visiting again. Do you do newsletters by email? Hey there. I found your web site by means of Google while searching for a comparable topic, your web site got here up. It appears to be good. I’ve bookmarked it in my google bookmarks to come back then. Hiya, I’m really glad I’ve found this info. Nowadays bloggers publish just about gossip and web stuff and this is really annoying. A good website with exciting content, that is what I need. Thank you for making this web-site, and I will be visiting again. Do you do newsletters by email? Hiya, I’m really glad I have found this information. Today bloggers publish just about gossip and web stuff and this is actually annoying. A good blog with exciting content, that’s what I need. Thank you for making this web-site, and I will be visiting again. Do you do newsletters by email? Hello there. I found your site by means of Google even as searching for a similar subject, your web site came up. It seems to be good. I’ve bookmarked it in my google bookmarks to come back then. Hello there. I found your blog by way of Google at the same time as looking for a similar topic, your website got here up. It appears to be good. I’ve bookmarked it in my google bookmarks to visit then. Hey there. I found your website by the use of Google whilst searching for a related topic, your web site came up. It appears to be good. I have bookmarked it in my google bookmarks to visit then. Hi there. I found your site via Google while looking for a related subject, your web site got here up. It seems to be great. I’ve bookmarked it in my google bookmarks to visit then. Hi there. I discovered your web site by way of Google whilst looking for a related subject, your web site came up. It appears good. I’ve bookmarked it in my google bookmarks to come back then. I just could not leave your website prior to suggesting that I really loved the usual info an individual provide for your visitors? Is gonna be again incessantly to check up on new posts. Hi there. I found your website by means of Google at the same time as looking for a comparable subject, your site came up. It looks great. I have bookmarked it in my google bookmarks to visit then. Hello there. I found your web site by means of Google whilst searching for a similar matter, your web site came up. It appears great. I’ve bookmarked it in my google bookmarks to visit then. Hey there. I found your blog by way of Google even as looking for a comparable subject, your website came up. It seems to be good. I’ve bookmarked it in my google bookmarks to come back then. Hi there. I discovered your blog by means of Google even as searching for a related matter, your website came up. It seems to be great. I have bookmarked it in my google bookmarks to visit then. Hiya, I am really glad I have found this info. Nowadays bloggers publish only about gossip and net stuff and this is really annoying. A good blog with exciting content, that’s what I need. Thanks for making this site, and I will be visiting again. Do you do newsletters by email? Hiya, I am really glad I have found this info. Today bloggers publish only about gossip and net stuff and this is actually frustrating. A good blog with interesting content, that is what I need. Thank you for making this website, and I’ll be visiting again. Do you do newsletters by email? Hi there. I discovered your site via Google while looking for a similar subject, your web site got here up. It seems good. I’ve bookmarked it in my google bookmarks to visit then. Generally I don’t learn post on blogs, however I would like to say that this write-up very forced me to check out and do so! Your writing style has been amazed me. Thanks, very great post. Hey there. I discovered your web site via Google at the same time as searching for a related subject, your web site came up. It seems to be good. I have bookmarked it in my google bookmarks to visit then. Hello there. I discovered your web site by the use of Google whilst looking for a comparable subject, your site got here up. It appears great. I have bookmarked it in my google bookmarks to come back then. Hey there. I discovered your site by means of Google at the same time as looking for a similar subject, your website came up. It looks great. I have bookmarked it in my google bookmarks to come back then. I really enjoy reading on this internet site , it has got superb content . “Wealth and children are the adornment of life.” by Koran. Hi there. I found your website by way of Google even as searching for a related subject, your web site came up. It appears to be great. I’ve bookmarked it in my google bookmarks to visit then. Hiya, I’m really glad I have found this information. Today bloggers publish only about gossip and internet stuff and this is really irritating. A good site with exciting content, that’s what I need. Thank you for making this web site, and I’ll be visiting again. Do you do newsletters by email? Hi there. I found your website by the use of Google while searching for a similar topic, your web site got here up. It looks great. I have bookmarked it in my google bookmarks to visit then. Amazing blog! Do you have any helpful hints for aspiring writers? I’m planning to start my own website soon but I’m a little lost on everything. Would you recommend starting with a free platform like WordPress or go for a paid option? There are so many choices out there that I’m totally confused .. Any suggestions? Appreciate it! Hey there. I discovered your blog by means of Google while searching for a related topic, your site got here up. It seems to be great. I’ve bookmarked it in my google bookmarks to visit then. Hi there. I found your web site by way of Google while searching for a similar topic, your web site came up. It seems great. I have bookmarked it in my google bookmarks to visit then. Hey there. I found your website via Google while searching for a comparable subject, your website got here up. It looks good. I’ve bookmarked it in my google bookmarks to come back then. Hi there. I discovered your website by way of Google whilst looking for a comparable matter, your web site got here up. It looks good. I’ve bookmarked it in my google bookmarks to visit then. Hello there. I discovered your site by the use of Google whilst searching for a comparable topic, your site got here up. It appears to be great. I’ve bookmarked it in my google bookmarks to visit then. Hi there. I discovered your blog by way of Google while looking for a related matter, your web site came up. It seems great. I have bookmarked it in my google bookmarks to come back then. Hello there. I discovered your website by way of Google even as searching for a comparable topic, your site got here up. It appears great. I have bookmarked it in my google bookmarks to visit then. Hey there. I found your website via Google while looking for a related topic, your website got here up. It appears great. I have bookmarked it in my google bookmarks to come back then. Hiya, I’m really glad I have found this information. Today bloggers publish only about gossip and net stuff and this is really frustrating. A good website with interesting content, that is what I need. Thank you for making this web-site, and I will be visiting again. Do you do newsletters by email? Hello there. I discovered your site by way of Google even as looking for a similar matter, your web site came up. It appears to be great. I’ve bookmarked it in my google bookmarks to visit then. Hiya, I’m really glad I have found this information. Today bloggers publish only about gossip and net stuff and this is actually annoying. A good website with interesting content, that is what I need. Thank you for making this web-site, and I’ll be visiting again. Do you do newsletters by email? Hi there. I discovered your site via Google at the same time as searching for a comparable subject, your web site got here up. It appears to be good. I have bookmarked it in my google bookmarks to visit then. Hey there. I found your site via Google even as searching for a similar matter, your website came up. It seems to be great. I’ve bookmarked it in my google bookmarks to come back then. Hiya, I’m really glad I’ve found this information. Nowadays bloggers publish only about gossip and net stuff and this is actually frustrating. A good blog with exciting content, that is what I need. Thank you for making this web-site, and I’ll be visiting again. Do you do newsletters by email? Hiya, I am really glad I have found this information. Today bloggers publish only about gossip and net stuff and this is actually irritating. A good site with interesting content, that is what I need. Thanks for making this website, and I will be visiting again. Do you do newsletters by email?